Choose from the wide range of TV Units by Exclusive Furniture World. The Doral corner tv unit is crafted in traditional French oak style. The rounded top edges gives a d.. The Doral TV unit is crafted in traditional French oak style. 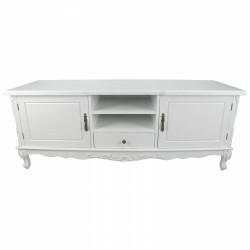 The rounded top edges gives a de..
French Antique Silver Large Cabinet TV UnitDimensions:H60 x W157 x D50cmMaterial:Hardwood + MDFEAN:7..
French Cream Large Cabinet TV Unit Dimensions:H60 x W157 x D50cmMaterial:Hardwood + MDFEAN:743491454..
French White Large Cabinet TV Unit Dimensions:H60 x W157 x D50cmMaterial:Hardwood + MDFEAN:649016498..
French White TV Unit Dimensions:H51 x W85.5 x D35cmMaterial:Hardwood + MDFEAN:6490164078191Packing S..
Orb Black 3 Drawer 2 Door Large SideboardLarge SideboardBrand: OrbItem: 3 Drawer 2 Door Large Sidebo..
Orb Black Small TV CabinetTV CabinetBrand: OrbItem: Small TV CabinetColour: BlackSKU: OB-BLK25002STV..
Orb Black Widescreen TV CabinetTV CabinetBrand: OrbItem: Widescreen TV CabinetColour: BlackSKU: OB-B..
Orb White Small TV CabinetTV CabinetBrand: OrbItem: Small TV CabinetColour: WhiteSKU: OB-WHT25002STV..
Orb White Widescreen TV CabinetTV CabinetBrand: OrbItem: Widescreen TV CabinetColour: WhiteSKU: OB-W.. The Orland corner tv unit is finished in solid oak with oak veneers and features striking heavy roun.. The Orland high corner TV unit is finished in solid oak with a semi-gloss lacquer seal. The rounded ..